Rescue the pet and simultaneously release the key in the right part of the screen (two last columns). Repeat the procedure in the two first columns. Try to keep the locked blocks in the first lines and use the rocket to destroy the metal boxes under the pets. 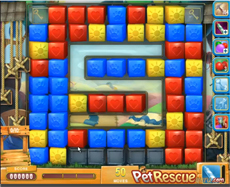 Clear the blocks where possible trying to rescue the pets. Don’t use the key when there are moves to do in order to rescue the pets. In case you find #519 tough you should spend a minute to elaborate our tactic by watching our video!